The Capture Map Coordinates functionality allows the user to capture the current location coordinates and display them in geo_data and geo_remark fields from FieldSample_v1 of the FieldSampleForm. Note: This functionality only works on the FieldSampleForm; the form must have a currently-selected, valid field sample record. 1.Enable the geo_data and geo_remark fields in the Field Sample Form by clicking Setup, then checking the box next to the fields. 4.In the map interface, ensure that the location services have been enabled by confirming the satellite icon is green instead of red. This can be turned on and off by clicking the icon. 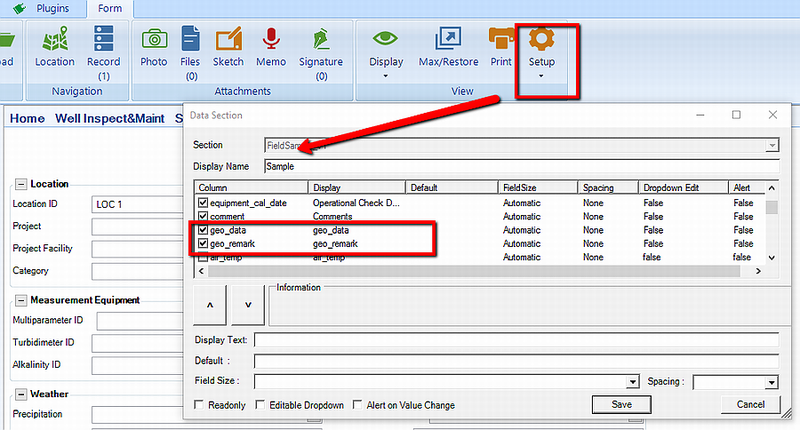 5.Ensure the correct location is selected in the right-side pane, then click Capture. 6.Close the map interface and confirm the geography data in the geo_data and geo_remark sections in the Field Sample Form. 7.Save and Export the EDD to EDP. Data from these fields will be mapped to DT_SAMPLE_PARAMETER and DT_GEOGRAPHY. Note: The distance field is a measurement of the distance from the stored location coordinates, from Location_v1, to the location where the sample is collected. For example, if a location was originally noted at the top of a street, but the sample was collected at the bottom of the street, the distance field would indicate the difference between the two in meters. More information regarding the GPS Location services can be reviewed in the GPS Location article.